A new set of characters, a new setting in time and place, in this new novel from Colin Cotterill who has previously written seven books about Dr Siri, a coroner in 1970s Laos. This story is set in modern Thailand (no traditional dress allowed), in the current day and is focused around Jimm Juree, a 34 year old woman, who would like to be a crime reporter. Much of the start to the story introduces the new characters, including Jimm's mother Mair, her brother Arny, her brother/sister, Sissie, and her grandfather Jah. At the start of the book, we learn that Jimm has only recently moved to a small hotel outside a small village on the Gulf coast, at the whim of her mother, who sold the family shop in the big bustling Chang Mai without telling anyone, to buy the hotel. Partly for this reason, Jimm suspects that Mair is starting to become somewhat senile, but in actuality Mair still seems to be very savvy. Jimm's grandfather Jah, has moved with them, as has her brother Arny. But Jimm's other brother, now a sister (Sissie), has remained behind in Chiang Mai. Sissie was a 'lady boy', and then married, and her wedding gift was the operation to become a real woman. The marriage (and Sissie) fell apart, and she now spends her days closeted in her apartment with her computer, running various internet businesses, and hijacking others, for profit. Having moved to the coast, Jimm now spends most of her days taking Mair's two dogs for a walk and gutting mackerel for lunch, having been designated cook. But then she learns of the discovery of two dead bodies in a buried VW Kombi Camper van, on a coconut plantation and finally finds a story she can write about. Following up on the story, she visits the police station to talk to the police about the case, who are remarkably helpful. On her way out she happens to overhear part of a furtive conversation between Sergeant Phoom and Major Mana about a top secret crime. After the Major leaves, she manages to convince the Sergeant that she already knows about the mysterious case, and discovers from him that a visiting abbot at the local monastery, the Feuang Fa temple, has been murdered. Jimm is determined to find out more. Jimm now has to juggle mackerel gutting, with trying to solve these two cases, as well as trying to work out what her mother is up to and attempting to fend off Ed, a local man that her mother has lined up for her, as a potential boyfriend. She has help from her grandfather, an ex-policeman, looked over for promotion due to his refusal to take bribes, who is able to bring some remarkable and key insight into what's going on, and can use his old connections with other policemen to help Jimm with her investigation. Moreover Sissie is a whizz on the computer, and able to hack into any number of databases to find out information that Jimm needs to help solve her cases. Rather like the set of books set in Laos, the characters in this new book are all a bit eccentric. Adding to the eccentricity, each chapter is prefaced by a short quote from George W Bush (usually pretty nonsensical!). This is apparently linked to the Jimm's analysis of George Bush's oratory style during her MA course, where she learnt that a 'sincere countenance and a confident stance were sufficient to distract your audience from the fact that you were talking rubbish', something she occasionally finds useful in her investigations. As always with a new book, and a new set of characters, it takes a little bit of time to get to know everyone and their idiosyncrasies. It lacks the political undertones of the Laos stories, but this makes for a more light-hearted story, which was highly entertaining. A great beginning to what I'm sure will become a series of books. 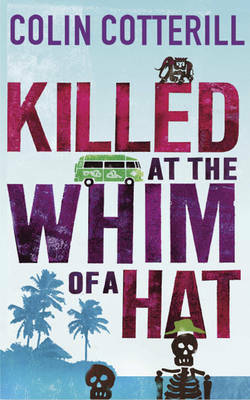 Read another review of KILLED AT THE WHIM OF A HAT.